Customize your keyboard, joystick, and mouse with an open source scripting language (AutoHotkey) that is backward compatible with AutoIt v2. AutoHotkey it includes a quick-start tutorial, an automatic script writer (macro recorder) that records your keystrokes and mouse clicks, and a comprehensive help file. Automate almost anything: Send keystrokes &amp; mouse clicks; launch programs / documents; work with the clipboard, registry, &amp; soundcard settings. In addition to its automation features described below, AutoHotkey excels at hotkeys, able to make virtually *any* mouse/joystick button, keyboard key, or combination into a hotkey. AutoHotkey it can also individually disable or override Windows' own shortcut keys, such as Win+E and Win+R. It may also help alleviate RSI; for example, it can create substitutes for Alt-Tab using keys, mouse wheel, or buttons. Expand abbreviations as you type them. 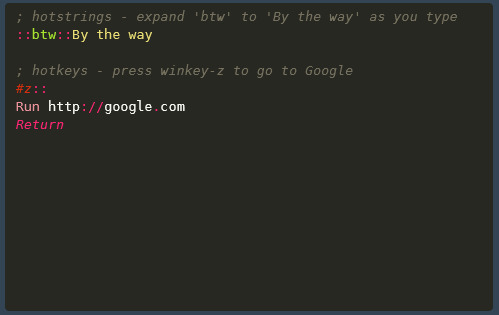 For example, typing "btw" can automatically produce "by the way". Create custom data entry forms, user interfaces, and menu bars. See GUI for details. Change the volume, mute, and other settings of any soundcard. Make any window transparent, always-on-top, or alter its shape. Use a joystick or keyboard as a mouse. Monitor your system. For example, close unwanted windows the moment they appear. Retrieve and change the clipboard's contents, including file names copied from an Explorer window. Disable or override Windows' own shortcut keys such as Win+E and Win+R. Alleviate RSI with substitutes for Alt-Tab (using keys, mouse wheel, or buttons). Customize the tray icon menu with your own icon, tooltip, menu items, and submenus. Display dialog boxes, tooltips, balloon tips, and popup menus to interact with the user. Perform scripted actions in response to system shutdown or logoff. Detect how long the user has been idle. For example, run CPU intensive tasks only when the user is away. Automate game actions by detecting images and pixel colors (this is intended for legitimate uses such as the alleviation of RSI). Read, write, and parse text files more easily than in other languages. Perform operation(s) upon a set of files that match a wildcard pattern. Work with the registry and INI files. Changed TV_Add/TV_Modify to allow "Bold1" and "Bold0". Fixed hotkey pairs with non-zero #InputLevel blocking sent events. Fixed Control Choose to send WM_COMMAND even if the control's ID is 0. Fixed heap corruption in scripts with keyboard hook but no hotkeys. Fixed escape sequences in one-line hotstrings with 'X' option. Fixed `` escape sequence preceding a ; comment flag. Fixed finally corrupting the value of a pending return. Fixed MsgBox to detect timeouts even if the thread is interrupted. Fixed Ahk2Exe to support more built-in variables in #Include. 3,268 7,085 AutoHotKey <img src="https://www.oldergeeks.com/downloads/gallery/thumbs/autohotkey_th.png"border="0"> Nov 12, 2018 - 11:50 1.1.30.01 4.64MB ZIP , out of 23 Votes.